The International Conference on Automated Planning and Scheduling (ICAPS) is the premier forum for researchers and practitioners in planning and scheduling - two technologies that are critical to manufacturing, space systems, software engineering, robotics, education, and entertainment. 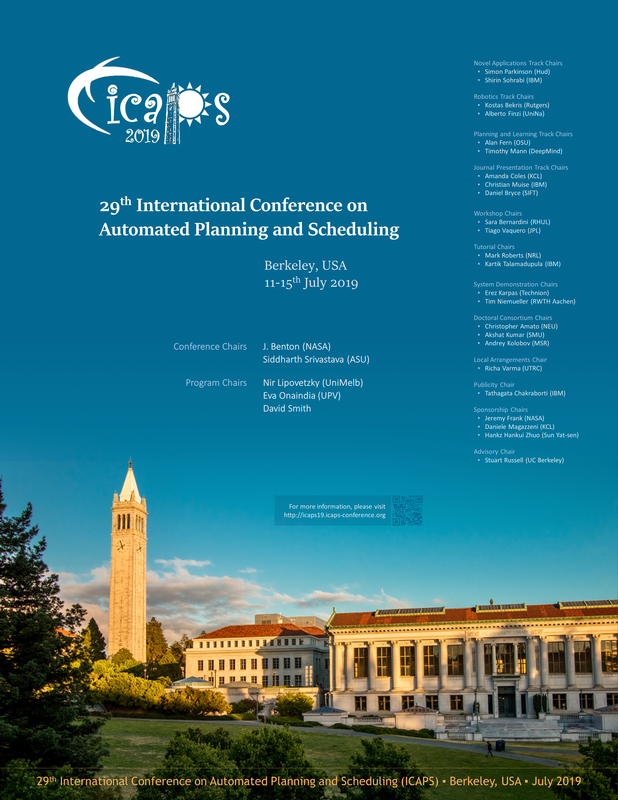 The ICAPS conference resulted from merging two bi-annual conferences, namely the International Conference on Artificial Intelligence Planning and Scheduling (AIPS) and the European Conference on Planning (ECP). ICAPS 2018 was held from June 23-29, 2018 in Delft, The Netherlands. Conference chairs are Matthijs Spaan and Mathijs de Weerdt. Program chairs are Sven Koenig and Gabriele Röger. ICAPS 2017 was held from June 18-23, 2017 in Pittsburgh, USA. Conference chairs were Stephen F. Smith and Laura Barbulescu. Program chairs were Jeremy Frank and Mausam. ICAPS 2016 was held from June 12-17, 2016 in London, UK. Conference chairs were Andrew Coles and Daniele Magazzeni. Program chairs were Amanda Coles, Stefan Edelkamp, and Scott Sanner. The field of Reasoning about Actions and Change (RAC) is a fundamental area of Knowledge Representation. In recent years, RAC moved from standard forms of reasoning, such as action sequence executability and future effects (projection), to more sophisticated forms of reasoning which share many commonalities with other fields of CS, from verification in Formal Methods to process modeling and analysis in Business Process Management. Connections between RAC and planning have naturally existed since the early beginnings of both areas. Generalized planning and synthesis, MDPs/RL, supervisory control, are all areas that are both related to planning and RAC. However, papers from these various areas are dispersed across many conferences, which makes it difficult to follow the general direction of the field. Drawing upon a successful format followed in other fields (e.g. http://highlights-conference.org), the workshop aims to offer a wide picture of the latest research in the field and a chance to meet everybody in the community. The workshop aims at providing a forum to discuss novel issues on planning, scheduling, and constraint satisfaction problems. Solutions to many real-world problems need to integrate plan synthesis capabilities with time and resource allocation, which can be efficiently managed by constraint satisfaction and OR techniques. Formulations of P&S problems as CSPs, resource and temporal global constraints, and inference techniques are of particular interest of COPLAS. The motivation for using hierarchical planning formalisms is manifold. It ranges from an explicit and predefined guidance of the plan generation process and the ability to represent complex problem solving and behavior patterns to the option of having different abstraction layers when communicating with a human user or when planning co-operatively. The best-known formalism in the field is Hierarchical Task Network (HTN) planning. In addition, there are several other hierarchical planning formalisms, e.g., hybrid planning (incorporating aspects from POCL planning), Hierarchical Goal Network (HGN) planning (incorporating a hierarchy on goals), or formalisms that combine task hierarchies with timeline planning (e.g. ANML). Hierarchies induce fundamental differences from classical planning, creating distinct computational properties and requiring separate algorithms from non-hierarchical planners. Many of these aspects of hierarchical planning are still unexplored. Thus, we encourage any contribution, independent of the underlying hierarchical planning formalism, and want to provide a forum for researchers to discuss the various aspects of hierarchical planning. Heuristics and search algorithms are the two key components of heuristic search, one of the main approaches to many variations of domain-independent planning, including classical planning, temporal planning, planning under uncertainty and adversarial planning. This workshop seeks to understand the underlying principles of current heuristics and search methods, their limitations, ways for overcoming those limitations, as well as the synergy between heuristics and search. The HSDIP workshop has always been welcoming of multidisciplinary work, for example, drawing inspiration from operations research (like row and column generation algorithms), convex optimization (like gradient optimization for hybrid planning), constraint programming and satisfiability, or applications of machine learning in heuristic search (e.g. base policies, learning heuristics, adaptive search strategies, or heuristic selection). We will keep this stance, particularly as ICAPS 2019 will continue the special track on planning & learning. Automated planners are increasingly being integrated into online execution systems. The integration may, for example, embed a domain-independent temporal planner in a manufacturing system (e.g., the Xerox printer application) or autonomous vehicles. The integration may resemble something more like a "planning stack" where an automated planner produces an activity or task plan that is further refined before being executed by a reactive controller (e.g., robotics). Or, the integration may be a domain-specific policy that maps states to actions (e.g., reinforcement learning). Online learning may or may not be involved, and may include adjusting or augmenting the model, determining when to repair versus replan, learning to switch policies, etc. A specific focus of these integrations involves online deliberation, bringing to the foreground concerns over how much computational effort planning should invest over time. But reality rarely proceeds according to the plan or the model. Planning, plan execution, diagnosis, and causal explanation have each been examined by various research efforts, but discussion of the linkages between them in the literature is still somewhat sparse. The IntEx workshop aims to provide a forum for discussing the challenges of integrating planning with execution, emphasize the role of diagnosis in online planning and execution. The International Planning Competition (IPC) is held every few years in the context of ICAPS. It empirically evaluates state-of-the-art planning systems on a number of benchmark problems. The goals of the IPC are to promote planning research, highlight challenges in the planning community and provide new and interesting problems as benchmarks for future research. The IPC has an important role in the ICAPS community, being a forum to compare different algorithmic ideas and implementations, and setting standards for research and evaluation in the area. This workshop aims to review the current status of the IPC, analyze the results of the last IPC (2018), and provide a venue for discussing aspects that will be helpful for preparing forthcoming competitions. Despite the progress in automated planning and scheduling systems, these systems still need to be fed by carefully engineered domain and problem description and they need to be fine-tuned for particular domains and problems. Knowledge engineering for AI planning and scheduling deals with the acquisition, design, validation, and maintenance of domain models, and the selection and optimization of appropriate machinery to work on them. These processes impact directly on the success of real-world planning and scheduling applications. The importance of knowledge engineering techniques is clearly demonstrated by a performance gap between domain-independent planners and planners exploiting domain-dependent knowledge. The workshop shall continue the tradition of several ICKEPS and KEPS workshops, covering all aspects of knowledge engineering for AI planning and scheduling. This year, the workshop will also have a specific focus (and a special session) on the task of model acquisition, particularly through learning approaches. In recent years, AI decision-making and autonomous systems have become an integrated part of the economy, industry, and society. The evolving economy of the human-AI ecosystem raises concerns regarding value bias and risks inherited by AI systems. The availability and the increasing demand for AI systems created by many disciplines of intelligent systems addressing sub-aspects of the problem-solving process (e.g., different learning methods, data storage, information retrieval and more) create discrete components. These discrete components might individually be efficient and effective, but as a combined system their effectiveness is reduced. Effective planning of a rational decision-making process is the natural tool that links and guides a divided process of practical problem-solving. This workshop intends to build a bridge between many disciplines such as AI, optimization, planning, problem-solving and decision making. 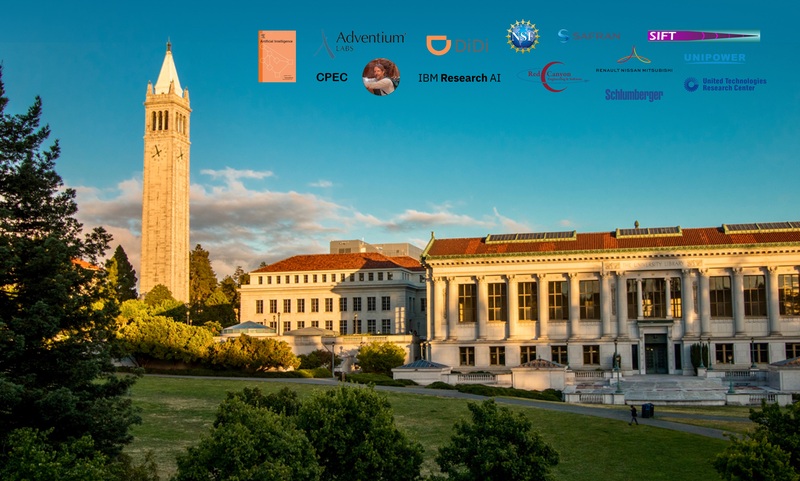 It will bring together researchers and practitioners from academic, industry and economic environments, to build a platform for an ongoing cross-fertilization of ideas and tools to solve decision making and planning problems. AI Planning & Scheduling (P&S) methods are crucial to enable intelligent robots to perform autonomous, flexible, and interactive behaviors, but a deep integration into robotic architectures is needed for their effective deployment. This requires a close collaboration between researchers from both the AI and the Robotics communities. In this direction, this workshop aims at constituting a stable, long-term forum where researchers from both the P&S and the Robotics communities can openly discuss about relevant issues, research and development progress, future directions and open challenges related to P&S when applied to Robotics. The PlanRob workshop is proposed in synergy with the ICAPS Robotic track. Real application domains that contain planning and scheduling (P&S) problems present a set of interesting challenges to the AI community: from modelling to technical to institutional issues. The international Scheduling and Planning Applications woRKshop (SPARK) series was established to foster the practical application of advances made in the AI P&S community. The workshop welcomes contributions on to the application-relevant aspects of P&S theory and practice, and especially contributions on experiences relating to deploying P&S systems. Topics of the workshop include: Novel domains and benchmark or challenge problems; P&S systems from their conception to their maturity in practice; Comparison with previously existing technologies and/or systems; Integration of operational knowledge from existing legacy components; User interface design, visualization and explanation; Engineering, deployment, and maintenance; Evaluation, testing, and validation; and Assessment of impact on end users. Explainable Artificial Intelligence (XAI) concerns the challenge of shedding light on opaque models where transparency is important, e.g. in analysis or synthesis tasks. In particular, as AI is increasingly being adopted for deployed applications, the challenge of supporting interaction with humans is becoming more apparent. Partly this is to support collaborations with humans but also it is a necessary step in the process of building trust as humans migrate greater competence and responsibility to AI systems. The challenge is to find effective ways to characterize and communicate the foundations of AI-driven behavior when the algorithms that drive it are far from transparent to humans. While XAI at large is primarily concerned with learning-based approaches, model-based Explainable AI Planning (XAIP) can play an important role in addressing complex decision-making procedures. After the success of previous workshops on XAI and XAIP, the mission of this workshop is to mature and broaden the XAIP community, fostering continued exchange on XAIP topics at ICAPS.